You could be searching on Google for days until you find some information which might actually benefit you. Many PPC articles already out on other websites are only telling you the obvious because they see the article as a good way to get tons of traffic to their site making them money. Anyone can do that and it does get frustrating how repetitive some articles get on the internet. It seems to me that one person makes a brand new article with a USP. After that, everyone copies it in an attempt to steal some of the traffic and success the original creator got. I hope this article is going to be one of few to you which will hold some valuable tips that you can use throughout your whole PPC career. Here are some tips to gaining success in PPC. Some advertisers judge the success of their campaign to how low they can get their cost per click down to while getting the same amount of clicks and impressions etc.. The benefit of this is that if you are on a budget, which many people are, you will get more value for your money being more clicks for your money. 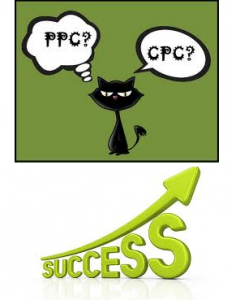 What determines a CPC is the competition for that keyword. For example, if the keyword, ‘Adsense’ didn’t have many advertisers wanting to bid for it, it will have a low CPC. On the other hand, from the highest paying keywords from Adwords, ‘insurance’ has a high CPC of $55 because many people are bidding on it as it is gaining them good results. Therefore, if you are not too fussed with your keywords, try and choose cheaper keywords to gain success with your CPC in PPC. By using SlowSEO’s keyword generator, the keyword ‘car’ has a CPC of 4.52. Now, if let’s say our campaign was about sports cars, the keyword ‘sport compact car’ is only worth 1.45. Both bring the same traffic but one is more than half the value of the other! As well as this, it makes your campaign more specific to the type of people you want to attract. The keyword ‘car’ can attract just about anybody with a car. While, the keyword ‘sport compact car’ attracts a much much more specific and smaller portion of people who have cars making your campaign run efficiently. If you are looking for CPC success in PPC where you want to decrease your cost per click of keywords, make them more specific and look for cheaper alternatives to the keywords you are currently using. As well as decreasing the cost of your campaign, it will make the traffic much more relevant to what you are attempting to advertise.